I'm not a lover of bananas. In fact, I'd go so far as to say that unless they're part of some sort of dessert or drink, I'm categorically not interested. I've realised it's something to do with the texture that I don't like, so when it comes to salvaging over-ripe bananas, they're blended to within an inch of their lives, or they're going straight in the bin, because there's absolutely nothing worse than lumps of banana in your food. I was having a super productive day yesterday and just so happened to notice (genuinely!) that we had some ready-for-the-bin bananas. I haven't done any baking in a long time, so I thought I'd give it a go at making something out of them. I got the hugest jar of Nutella for Christmas, so it struck me as a bit of a no brainer to put the two together. It really is such an easy recipe, but it's so delicious. I reckon it's best served with a coffee, so you could definitely eat it for breakfast/brunch as well as during the afternoon for a snack. My theory behind that is that it's pretty substantial and doesn't have too much added sugar (due to the bananas and Nutella), so as far as cake for breakfast goes, it's relatively healthy and will keep you going for a decent length of time. I'll point out at this stage that because I'm lazy (and wanted to avoid as many lumps as possible), I mixed the batter in the food processor the whole way through. You absolutely don't need one to make this recipe, but it sure does make it easier! Using a fork to mash the bananas, and a wooden spoon to mix the batter would definitely work too. Anyway I shared a time-lapse on my Instagram stories and asked if you guys wanted the recipe. Not a single person voted no, so here it is. My best piece of advice? 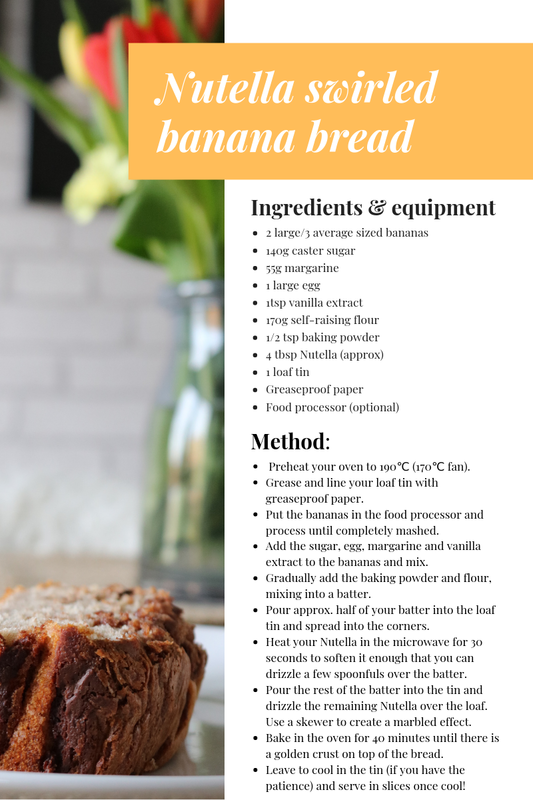 If you do decide to make this banana bread, is to nab the end slice for yourself before anyone else can 'volunteer' to take it off your hands. It is without a doubt the best slice - you can thank me later. Preheat your oven to 190℃ (170℃ if you have a fan-assisted oven). Line your loaf tin with greaseproof paper (you can grease it first if you like, but I generally don't bother). Put the bananas in the food processor and process until completely mashed. If you like your banana bread to have lumps of banana in and/or you don't have a food processor, you can just mash the bananas in a bowl with a fork and mix the rest of the ingredients by hand. Add the sugar, egg, margarine and vanilla extract to the bananas and mix until fully combined. Gradually add the baking powder and flour, mixing until everything is combined into a batter. Pour approximately half of your batter into the lined loaf tin and spread it out into the corners. Gently heat your Nutella in the microwave for 30 seconds to soften it enough that you can then drizzle a few spoonfuls over the batter in the tin. Pour the rest of the batter into the tin. Drizzle the remaining Nutella over the loaf and then use a skewer (a knife would also work) to create a marbled effect. Bake in the oven for 40 minutes until there is a golden crust on top of the bread. Once it's baked, take it out and leave it to cool in the tin (if you have the patience). Serve in slices and enjoy!